Notes: I am rating the American dub that was made for HBO back in 1980. This series is very old, and copies of it are very rare gems indeed. This series is a historical one as far as the magical girl genre goes, as it is the first ever of its kind to be broadcast in North America. Hana no Ko LunLun has recently reentered distribution in Japan. Angel is a tomboyish preteen girl living in a small European village. Her fourteenth birthday, however, is a time of revelation for her. For it is on this day that she meets the strange, talking dog Wendell, and his sassy partner, Katy the cat. It turns out they have searched the world far and wide for her, as she is the last of the Flower Children, fairy spirits who were born as humans. Angel is needed, as the King of the Fairies is dying, and Angel is the only one who can find the Seven-Colored Flower, a magical flower that only blooms once in a lifetime. This flower can restore the king's health, but Angel isn't the only one who wants the flower. There are other who wish to use the flower's magic for their own nefarious purposes, including taking over the Fairy Kingdom itself. So Angel travels the world along with Katy and Wendell, and along with the help of a mysterious, yet handsome man who always seems to be one step behind her, she spreads the word of truth and kindness towards all and comes to discover a far greater destiny than she could ever imagine. 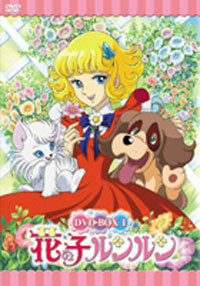 Before Card Captor Sakura, before Sailor Moon ... before even Minky Momo, there was Angel. I was five years old when this series aired, and it was my first ever introduction to anime (but of course, back then I had no idea what anime was). To me, Angel was the most beautiful girl I had ever seen. Back then, all Saturday morning/after school cartoon fare were either just for boys or so gender-neutral you couldn't identify with any of them, whereas Angel was a lead character in her own show. She traveled on her own and did all sorts of wonderful things with her magical brooch, which turned her into whatever she wanted. She was a princess, a gypsy, a firefighter...yet never compromised the fact she was very much indeed a girl. She solved problems by talking things out and working with others, not by trying to 'be manly' and fight them out. She was independent and strong-willed, and she was like no character, male or female, that I had ever seen in a cartoon. And I *loved* her for it! Angel is no ditz. She is genuinely kind and graceful. She doesn't always act rationally, but she never acts out of ignorance or selfishness. She is earnest and determined to do what is needed, and will go to any length to achieve her goal. She really is a anime rarity, even by today's standards: An heroine who is strong but not violent, not hung up on dating or bemoaning her fate ... she is the most accurate, purest portrayal of a female heroine I have ever seen in an animated show. Her companions, Katy and Wendell, are also a lot of fun. They provide most of the comic relief, and are just as capable as Angel herself. Sure, Wendell likes to sleep too much, and Katy can be mouthy when she shouldn't be. (After all, it's perfectly normal for a cat to talk! It's not her fault all the silly humans freak out over it! ^_^) They are more Angel's best friends than they are pets or even familiars. The story is also very intriguing. Each and every one of her adventures has a flower theme to it (hence the title), and at the end of each episode, the people she has helped are given seeds of the flower that embodies the message or spirit of the show. There's none of the typical heavy-handed morality that is seen nowadays in most children's shows. Angel is almost literally sowing the seeds of love as she goes from one new adventure to another, but it's not as much to teach a moral, but it is also the main point of the show. The people of Angel's world have lost their innocence and their consideration to others. Angel's mission is not so much to find the Seven-Colored Flower, but to touch every life she comes in contact with and teach them to remember to be good to each other. That Angel teaches this lesson in such a gentle, realistic way is very much a credit to her and to this series. Angel is the kind of children's entertainment I miss seeing nowadays. For a brief period in the early to mid 80's, shows could be for girls or boys only, and appeal to them on the levels they crave. Boys had Thundercats and He-man, while girls had She-Ra and My Little Pony, and one could like the other and not be (too) ashamed of it. Nowadays, it seems all shows are back to being gender-neutral, all in the name of 'equality'. To make it worse, it must be 'educational' too; hence we have current drivel such as Histeria and Captain Planet. Even Sailor Moon couldn't make it over to the States without having the god awful "Sailor Says" segments tacked on. I shudder to think what would have become of Angel had she been put on air today. At least 4Kids left Pokemon pretty much alone, yet that too is gender-neutral. Sadly, the old dub of Angel is very dated, with 70s disco music as BGM, and the animation quality is downright bad compared to today's ultra-glossy style. Angel is also very much a shoujo series, but the style is more curvy and elegant than outright cutesy. The voice acting in it, however, was surprisingly well-done for the time. Angel is a beautiful gem of anime past that deserves to be recognized as one of the best ever. Cute without inducing sugar-shock, nowadays Angel would really be relegated to children under eleven, but that's ok. Angel was not meant as anything more...or less. If you happen to find a very old copy of it in the back of the children's section at Blockbuster or (preferably) any older video store nearby, I strongly suggest checking it out. Share it with a younger member of the family, or simply relive the days when all you ever needed to know about anime was that it came on after school. Recommended Audience: All ages. There is absolutely nothing at all objectionable in this series, either Japanese or American versions. Another great starter series for younger anime fans who currently are into either Sailor Moon or Pokemon.